Forget the Michael Crichton book (and Spielberg movie) that copied the title. This is the original: the terror-adventure tale of The Lost World. 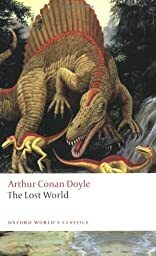 Writing not long after dinosaurs first invaded the popular imagination, Sir Arthur Conan Doyle spins a yarn about an expedition of two scientists, a big-game hunter, and a journalist (the narrator) to a volcanic plateau high over the vast Amazon rain forest. The bickering of the professors (a type Doyle knew well from his medical training) serves as witty contrast to the wonders of flora and fauna they encounter, building toward a dramatic moonlit chase scene with a Tyrannosaurus Rex. And the character of Professor George E. Challenger is second only to Sherlock Holmes in the outrageous force of his personality: he's a big man with an even bigger ego, and if you can grit your teeth through his racist behavior toward Native Americans, he's a lot of fun.